The following is a response to Mark Alan Hewitt’s review of the exhibition and catalogue for Gustav Stickley and the American Arts and Crafts Movement. Both the review and the response appeared in the Volume 19, No. 1 issue of West 86th. Kevin W. Tucker, the Margot B. Perot curator of Decorative Arts and Design at the Dallas Museum of Art, curated the exhibit and was editor of the catalogue. 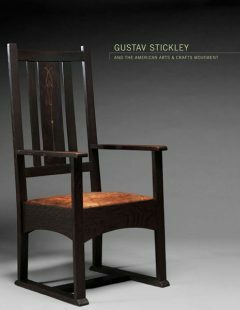 As the organizing curator and lead author for the exhibition and accompanying catalogue for Gustav Stickley and the American Arts & Crafts Movement, I am compelled to write to you in response to a number of troubling inaccuracies, from misleading speculation to suggestions of impropriety, contained within Mark Hewitt’s recent review. While the reviewer generally lauds the first nationally touring exhibition of Stickley’s work as containing “impressive” objects which as organized “enriches our understanding of his particular genius,” he muses over the exhibition’s title as seemingly too broad relative to the predominance of furniture within the checklist. As Hewitt rightly offers, Stickley’s career can be (and indeed has often been) explored from the perspective of “myriad subjects” and the work of his firm certainly included a range of media and, through his magazine, The Craftsman, touched upon numerous topics of interest to scholars studying the arts and crafts movement. Nonetheless, Stickley began, enriched, and essentially concluded his professional life around what was at core a business involving the production and sale of many thousands of pieces of manufactured furniture—works which remain primary to an understanding of his image and legacy. As made clear within my introduction to the catalogue, the project “does not purport to revisit the entire spectrum of Stickley’s life and career” but instead focuses upon select topics intersecting his work and the “most emblematic and aesthetically sophisticated designs.” I view this as entirely appropriate for an exhibition and catalogue developed by an art museum which sought to highlight the creative concordances (and not simply dichotomies) between the shifting Craftsman aesthetic, brand identity, and arts and crafts ideology (p. 14). The decision to include “Arts and Crafts” within the title was to generally acknowledge this linkage with what his enterprise was shaped by and subsequently helped shape. Given Stickley’s interests in furniture and his factory’s prodigious output of such, that most works chosen would be in this medium is hardly unexpected. While Hewitt’s speculation over the title is in itself of minor consequence, his misreading of intention here leads to far more egregious statements concerning the exhibition catalogue. With an erroneous statement solely crediting design and production to Yale University Press, the Dallas Museum of Art’s co-publisher, the reviewer summarily disregards the key contributions of an extensive list of museum staff and those at Marquand Books, all of whom played key roles in the realization of the catalogue. Hewitt’s subsequent claims suggesting the content of the book is mostly “a repetition of earlier work” by the same writers or, however ironic given his preceding omission of credit, from “unacknowledged scholars whom the writers have chosen to ignore or, worse, whose work has been appropriated,” are recklessly unsupported by his vague references and are, in sum, wrong. As he notes, there is “voluminous work” from the last decades on the subject of Stickley, including work both popular and academic in nature, with relevant works cited and included in our bibliography. Of greatly varying quality, it was also this aforementioned vast quantity of material on the subject of Stickley which compelled us to consider how to best introduce Stickley to museum audiences yet differentiate our efforts from those of writers and scholars who had come before. While Hewitt is again incorrect to offer that it appeared an editor “stipulated that only primary resources be cited” (emphasis mine) I, did exhort each of our essayists to give special consideration to such sources in hopes of developing our perspectives further than secondary sources alone would permit and with the belief that further archival research and object analyses would reveal new information about Stickley’s work. The essayists were rightly selective in choosing their secondary sources, especially given the focus of the project and the scope of their essays, but certainly did not fail to adhere to professional standards by citing the original concepts and language of others which were materially relevant to the topics addressed. Throughout, I found it curious that the reviewer repeatedly condemned or otherwise failed to recognize the value of primary source research within the book and instead confused it with work of others, including himself. However informative his and other publications may be concerning aspects of Stickley’s life and work, the movement, or topics of early twentieth-century studies, Hewitt’s criticism implicating supposedly uncited work suggests at the least a fundamental misunderstanding on his part. By apparently conflating what constitutes specific original ideas within secondary material informing a new work (and thus appropriately cited) with long-discussed, nonproprietary subjects or concepts (e.g., paradoxes, ideology versus practice, etc.) or our essayists’ work with primary sources, the reviewer naturally fails to provide detailed and positive evidence to support his claims of misappropriation. Yet he nonetheless attempts to do so, implying “neglect [of] standards of scholarly documentation” and raising long-reccurring themes such as the “dichotomies between machine production and arts and crafts ideology” which have been debated in and since Stickley’s time, and then subsequently providing his own selections of secondary material which the essayists considered unnecessary or otherwise tangential to the details of the text at hand. Selectivity in resources, objectively and judiciously done, is the prerogative of every good scholar. Additionally, going further to indicate that it is somehow a failure of the authors of an exhibition catalogue to exhaustively account for “all of the contemporary research published on Stickley and the American arts and crafts movement” is illogical for a work which does not purport to be a comprehensive monographic study or bibliographic review. Hewitt’s indication that David Cathers was the sole author to have published extensively on Stickley misleadingly implies the other contributors’ previous scholarly work was negligible as to their familiarity with pertinent resources for this project. While offering interestingly varied perspectives—a point which was key to my original selection of essayists—each author has distinguished him- or herself within the field of Arts and Crafts studies or relevant aspects of progressive twentieth-century design, including among their many achievements Dr. Brandt’s book The Craftsman and the Critic Defining Usefulness and Beauty in Arts and Crafts-Era Boston (Massachusetts, 2009) and Dr. Cunningham’s work The Artistic Furniture of Charles Rohlfs (New York: ADA1900 Foundation, 2008). Indeed, Dr. Brandt’s list of publications includes work which addresses Stickley’s enterprise as well as those of his Arts and Crafts furniture manufacturing siblings, and, while Hewitt admits Tommy and Beth Ann McPherson have expertise in “object design . . . and aesthetic history” and “know Craftsman Farms,” he neglects to mention they had served, respectively, as its director and curator.1 Beyond my more than two decades of work in the history of twentieth-century design, my own efforts with this project included a Winterthur Fellowship allowing for an extensive review of the Gustav Stickley Business Papers (as well as review of supplementary archival resources held by the Henry Ford Museum, Craftsman Farms, the Stickley Museum, private collectors, etc. ), over six years of object analysis and documentation, and study of the host of secondary references. While the reviewer questions “the choice of contributors” and dismissively assumes that my description of David Cathers’s comprehensive Gustav Stickley (Phaidon, 2003) as the definitive exploration “would not be supported by Cathers himself,” one is left to wonder what criteria he demands an essayist meet to be chosen for a publication which is not his own, or else presume one must have published “extensively” and directly upon the topic of Gustav Stickley, regardless of one’s expertise in one or more of the “myriad subjects” linked to his enterprise or that of the Arts and Crafts movement. The selection of essayists was made with the idea of addressing various topics which were fundamental to and informative of Stickley’s enterprise (e.g., the shift to Arts and Crafts production between 1898 and 1900; the Craftsman image and identity in furniture, ideology, and Irene Sargent; the duality of the Craftsman home; and the consideration of Stickley’s own homes and furnishings as functional and artistic expressions), yet in whole did not purport to cover the breadth of Stickley’s career or serve as a comprehensive presentation of the subjects at hand. As texts for a catalogue which would be read as a complement to the exhibition by those with varying degrees of familiarity with Stickley and the Arts and Crafts movement, it was, however, desirable for each text to frame a general introduction to its respective subject. As full details are neglected, one is repeatedly left to speculate as to the rationale for Hewitt’s complaints here and elsewhere; while some introductory facts were deemed necessary for the nonspecialist reader, it is unclear if this may have exacerbated or otherwise skewed his complaints of repetition, including that of Cathers’s and the McPhersons references to their prior work. The reviewer’s criticism of Cathers’s essay emphasizes this repetition of “key material” yet fails to accurately address the subject of the essay, that of the “economic and social context of the transformation of Stickley’s enterprise before 1900,” with specific focus between 1898 and 1900 as the titular “moment” of the text (p. 14). As the leading essay, Cathers’s rightly introduces the world of Stickley’s early enterprise and, as one would expect of one Hewitt rightly acknowledges as a “leading expert,” deftly builds upon the foundation of his knowledge to create a new addition to the body of published Stickley work which examines the confluence of a renewed economic prosperity in the late 1890s with the sophisticated American consumer who could purchase relatively expensive Arts and Crafts goods, including that of Stickley’s firm after 1900. Hewitt’s complaints of a “comparative analysis” focusing on British and European sources is curious, given that nowhere does Cathers provide an aesthetic or stylistic review, nor was it his intention to do so or to provide a larger contextual study of American Arts and Crafts guilds, another of the reviewer’s laments. Hewitt’s reading of my essay as primarily concerned with “furniture finishing methods” is also inaccurate, as is his belief that the preliminary section of the essay neglected published material, including his own Gustav Stickley’s Craftsman Farms: The Quest for an Arts and Crafts Utopia (Syracuse, 2001).Whatever specific “striking parallels” in the subject of “dichotomies between machine production and arts and crafts ideology” he purportedly saw here are left to the reader’s imagination, as review of cited publications shows only as broad a parallel as that—a topic, that of machine production relative to handcraft, which was widely debated in Stickley’s own time and publications, thus providing useful quotations for informing the topic of image making. That countless authors have engaged the subjects of duality, machine production, and the Arts and Crafts movement (including Stickley) now for well over a century is clear and, as a subject of debate, is hardly proprietary to Hewitt or others. Indeed, these are at their base, as Hewitt relates, “old questions” which proved useful to my work examined as contemporary (to Stickley) rather than modern, secondary commentary.2 Only a less than careful reading of my essay would suggest this one topic or a review of finishes is the essay’s purpose rather than related contextual points for revealing “Stickley’s transition to a producer of Arts and Crafts furniture . . . simultaneously seeking to establish a public image and rationale for his new direction,” as I noted in the catalogue’s introduction (p. 14). Linking a unique selection of texts contained within the Craftsman magazine to this topic was, in my approach, key and certainly original to my work here, informing the direction of the following subsection on the Craftsman style, also driven by primary sources, notably actual objects and the Gustav Stickley Business Papers held at Winterthur. Here, issues of style and aesthetic analysis, which comprise the majority of the essay, were entirely ignored by Hewitt, as were such important revelations and discussions as the discovery of the sole period document known to indicate Harvey Ellis as a designer of furniture, the identification of the source of one of Stickley & Simonds’s first artistic chairs, the associations of finishes and form with stylistic trends, and the challenge of maintaining the Craftsman brand identity with shifts in fashion (pp. 38–49). Aside from a brief reference to photographic quality, nothing is also said of over 170 pages which include select catalogue entries revealing key new details from aesthetic and material sources to association of works with an individual cabinetmaker, as well as lists of hundreds of Stickley retailers, employees, and associates assembled from period documents and intended as a resource for future scholars. While selectivity is also inevitable in a book review, the further misreading and wholesale neglect of large portions of our work calls into question his own “familiarity with this material” or understanding of it. Brandt’s essay on “The Paradox of the Craftsman Home” is subjected to similar criticism as to the prior work of others. Again Hewitt cites his own book from 2001 as a source, adding to it Ray Stubblebine’s annotated compendium of Craftsman houses.3 “Universality in specificity,” a phrase which was eliminated from the title of her essay in the editing process, nonetheless embodies the paradox upon which she focused (pp. 70–71). Here, her intention was to demonstrate how a generic type with widespread appeal could be designed to satisfy the needs of a particular client and location, an approach which differs significantly from the “complex parable” that Hewitt addressed in his own work. Issues of paradox, duality, or dichotomy have informed Brandt’s work since she first began publishing on the Arts and Crafts movement in the late 1980s.4 As Dr. Brandt has rightly recognized, paradox is, in fact, such an inherent part of the movement that it is ludicrous for any one author to attempt to stake a proprietary claim on its behalf. While the reviewer complains that essays on architecture and interiors seem “tangential” to the exhibition’s content, the purpose of these essays, as found in many exhibition catalogues, was to illuminate complementary topics. Ultimately, the proportion of architectural work included in the exhibition was dictated by factors of proportion relative to Stickley’s creative output, the availability and condition of extant drawings, and an assessment of the aesthetic and functional achievement of the houses as progressive architecture and as representative (or not) of the best work of Stickley’s enterprise. Even so, architecture was important to have featured in the exhibition through select examples and considered by Dr. Brandt in her text. Logically following, the essay by the McPhersons intended to bridge the personal realm of Stickley via the interiors of his Syracuse and Morris Plains homes, addressing the possible reasons for the use of particular furnishings, “the role these objects play in the interiors, and their meaning within the definition of the Craftsman ideal” (p. 15). While Hewitt declares the authors are wrong in their assertion of the relative rarity of art historians examining such objects “in the context of interior design,” he does not consider the obvious reference to the McPhersons work at Craftsman Farms. Where else can such a comprehensive selection of objects be seen holistically, more or less in situ (albeit reassembled with several like objects) within a de facto Craftsman home no less, as they were originally presented in Stickley’s time? The reviewer’s dismissal of Dr. Cunningham’s essay on Irene Sargent, improperly referenced as the final essay in the catalogue, again takes issue with the emphasis on primary source material, notably the author’s use of Sargent archives in Syracuse and a claim of “sparse footnotes” (of which there are seventy-one, many necessarily referencing Sargent’s writings), which Hewitt conflates to suggest that the author ignored fundamental work or exhibited a lack of awareness of secondary literature. However, he exhaustively surveyed secondary and tertiary sources (including those by Hewitt, Marilyn Fish, and Cleota Reed) on Stickley and Sargent, finding nothing there that warranted citation, and proceeded to develop the essay with a focus on analyzing primary sources that bore directly on Stickley’s ideology. Though Hewitt dismisses the essay as containing “little new or insightful,” it presents the first-ever critical analysis of Irene Sargent’s formulation of Stickley’s ideology in the Craftsman and other publications. These contributions include new facts related to dating the initial meeting of Sargent and Stickley, new information on Sargent’s education and her teaching at Syracuse University, the discovery of source material (from the writings of Lewis Foreman Day) for her first essay for Stickley, the first close analysis of Sargent’s various drafts of her seminal “Revival of Old Arts and Crafts,” the uncovering of her uncredited quotation of Thomas Carlyle’s Sartor Resartus, the synthesis of Sargent’s ideology and her perspectives on interior design, the first thoughtful analysis of Stickley’s and Sargent’s ideas about labor and the employees of the Stickley firm, the first philosophically rigorous interpretation of Stickley’s and Sargent’s specific relationships to and evocations of socialist ideas, the first theoretical evaluation of Sargent’s notions about the therapeutic nature of design, and, finally, the first synthesis of Sargent’s and Stickley’s notions of utility, simplicity, and beauty, evaluated as a simultaneous articulation of their aesthetic ideals and ideological discourse. Here too, Hewitt fails to provide a single specific example of misappropriation of an earlier author’s original idea. Ultimately, Hewitt’s grossest claims of a failure of standards within the catalogue are based upon accusations which are either wholly unsupported or are weakly attached by the reviewer to the works of select scholars which, however important as particular contributions to the larger body of knowledge about Stickley, do not provide him with clear validation for claims of appropriation. As all of our essayists value and adhered to scholarly standards of accuracy, integrity, and objectivity in our publication, so too, one may expect reviewers to follow the same principles in their work. Kevin W. Tucker is the Margot B. Perot Curator of Decorative Arts and Design at the Dallas Museum of Art. 1. Dr. Brandt includes, among her other publications, the foreword to Donald A. Davidoff and Stephen Gray, eds., Innovation and Derivation: The Contribution of L. & J. G. Stickley to the Arts and Crafts Movement (Parsippany, NJ: Craftsman Farms Foundation, 1995) and an extended introduction to The Craftsman on CD-ROM (Interactive Bureau, 1998), the latter of which served to inspire a further exploration of paradox within Stickley’s work in her essay for Gustav Stickley and the American Arts & Crafts Movement. Craftsman Farms was the New Jersey home of Gustav Stickley, a National Historic Landmark presently operated as the Stickley Museum at Craftsman Farms. 2. Beyond broader subjects of mechanization within the context of the ideology of the Arts and Crafts movement, the reviewer also fails to consider my notations concerning the factory’s structural and organizational details of workings as not “new angles on old questions,” but rather statistical quotations from primary sources including the Gustav Stickley Business Papers at Winterthur. That others, including Hewitt and Cathers, have drawn from this source is clear, but citations of my own selections within the context of an original study of Stickley’s developing aesthetic hardly constitute “striking parallels” in analyses. Neither does a close comparison of original concepts and text within Hewitt’s or Robert Edwards’s essay, “The Art of Work”, in Kaplan, The Arts and Crafts Movement in America (Boston MFA, 1987), regardless of the aforementioned shared subjects of paradox, craft, and the machine. In note 14 he also erroneously indicates that Cathers, Michaels, and France are the only scholars I cited in my essay; publications of Joseph Cunningham, Sharon Darling, Wendy Kaplan, and Michael E. Clark and Jill Thomas-Clark were also directly cited. 3. Both Hewitt’s and Stubblebine’s book, Stickley’s Craftsman Homes: Plans, Drawings, Photographs (Layton, U.T. : Gibbes Smith, 2006), were included in the catalogue bibliography. 4. See, for example, chapter 1 in the Encyclopedia of Arts & Crafts (London: Quarto, 1989). Brandt’s recent book, The Craftsman and the Critic: Defining Usefulness and Beauty in Arts and Crafts-Era Boston (Massachusetts, 2009), also concludes with a discussion of dual tendencies within the movement.